I recently received this Welo opal ring created by David Klass. The opal was purchased from Jim McCormick. These are David's pictures. So many beautiful opals on this thread, but this setting and stone combination are absolutely stunning! GliderPoss and leslie1956 like this. My latest...a vintage opal bangle bracelet. sapphiremomma, ilovegemstones, pwsg07 and 1 other person like this. translucency that you Can't tell in the piCs or video. Lightning Ridge 5.1 ct black crystal opal ring. Keeliamira, TheGarnetGirl, Catmom and 3 others like this. So gorgeous and plump! It is like an egg, or a micro universe inside a drop. Thanks Blugemz! I added a side shot of the stone! I adore your big star sapphire ring and this kind of reminds me of it. The same feeling! I don't think I can ever get a large, high-dome, translucent and saturated purplish blue star sapphire in my budget but I think I love opals like this just as much! I should have had it set in solid gold. It does have that same, ethereal and magic quality! It’s like a spirit stone. It would be amazing in gold, but the silver is also just beautiful. It’s just so fresh looking. Thanks so much for the kind words about my star. I had truly searched for decades, and happened to get lucky one day. We just never know when that will happen.....that’s the fun part. leslie1956 and ilovegemstones like this. Hi, I rarely venture into colored stones, but I just bought a white Lightning Ridge white opal from Black Opals Direct to eventually make a ring for my daughter with an October birthday! I have a black opal on my wish list, but I just haven't found "the one" yet (one that is in budget!). I went through this whole thread and enjoyed seeing all the opals! I will agree with those who said opals are extremely difficult to photograph. Their photo shows it a bit darker than it really is, but it shows the colors better than mine does. I hate to even post mine as the stone looks so much better in person! GliderPoss, ilovegemstones, leslie1956 and 4 others like this. I know ZERO about opals so for all I know this is a terrible quality one, but this was the first opal ring I ever liked. Colors are little more intense in person and quite lively. ilovegemstones, suzanne2, Catmom and 1 other person like this. I can't wait to see it set. 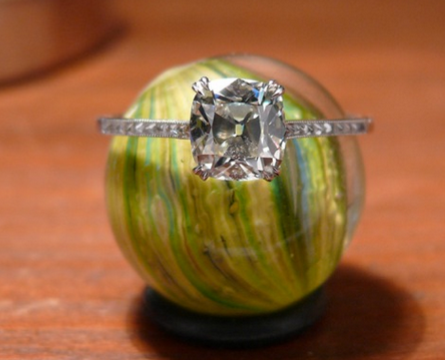 It will be a gorgeous ring!! Thanks, Michelle! I hope to get one almost as beautiful as one of yours one of these days! My first opal ring and I love it! The colour play is mesmerizing. It’s my son’s birthstone. suzanne2, diamondseeker2006 and Catmom like this. This opal ring flashed so brightly at me today that I had to buy it. Australian opal (crystal?) set in 18k yellow gold. It does show a couple of other colors, but only from the side. Hivona, ilovegemstones, voce and 6 others like this. Wow look at that play of colours, almost like a colour change! Acinom, TheGarnetGirl and suzanne2 like this. Here is my black opal bracelet in the sun and shade. from lighning ridge. Keeliamira, TheGarnetGirl, leslie1956 and 6 others like this. Wow! Love this opal bracelet! Gorgreousness! Calling all opal lovers, I'm not sure if this is the correct place to post this (I'm still new on this site) but I could use a few opinions! So I'm a silver lover at heart but when I saw this opal I knew that If I purchased it that it HAD to be set in gold...it will be a large purchase for me for the opal and the custom fabrication of the ring so I want some opinions just to know if this opal is as fabulous and different as I think it is! Honest opinions are welcome!! Also if this is the wrong place to post let me know! The opal is on hold and I will most definitely purchase it, it's a N2 freeform black opal from lightning ridge Australia and it's apprx a little over 10x16mm and 2.53 in thickness. I drew up this drawing for the setting....it's very rough so excuse that! The video from the seller was lovely...it has beautiful blue/green broadflash and reminds me of a butterfly wing or a mermaid scale. There are a few little sandspots and it's not perfect by any means but it was calling to me and I believe I found it at a steal. Ideas about the opal? About the setting? missy, ZestfullyBling, Acinom and 1 other person like this. That silver opal ring though.....ahhhh swoooon! I really love that opal too. It’s very interesting with the darker parts. It does remind me of a maid’s scale! Gorgeous and the setting with brushed gold will be amazing with it. As a side, I have an opal pendant which has a dark slice on the side. My mother chose it out of a few because she found it most unusual. TheGarnetGirl and leslie1956 like this. Thinking about heirloom jewelry makes me warm and fuzzy but there's something a little more special to me when it's opal jewelry that is passed on. It's a big purchase for me for fabrixafabr but I am oh so excited! That's what I get for grocery store shopping and being on here! jordyonbass and TheGarnetGirl like this. GliderPoss, Roi, prs and 2 others like this. GliderPoss, diamondseeker2006, ilovegemstones and 4 others like this.